There are an awful lot of reasons why genealogists should love Greg Boyd. Start with the fact that his Arphax Publishing Company has some of the most useful map books on the planet — the Family Maps series of Land Patent Books and the Texas Land Survey Maps series — county by county, state by state, maps showing original settlers whose purchases are indexed either in the U.S. Bureau of Land Management database or the Texas General Land Office database. Go on to his groundbreaking HistoryGeo.com website, where the records underlying those maps are accessible through a single interactive map where you can look for, say, every Zinkelschmidt in the areas covered by the database all at once. Or where there is another searchable database of more than 100,000 landowners shown on a collection of nearly 4,000 historical maps. And then there was Greg’s comment yesterday on Facebook. 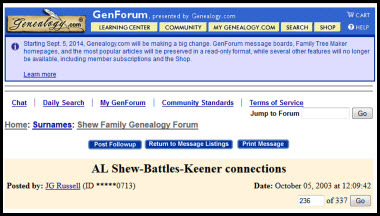 GenForum is the message board system of Genealogy.com — and Genealogy.com is among the services that Ancestry.com is shuttering as of September 30th.3 The GenForum message boards date back to the internet equivalent of the Dark Ages — some boards there have messages dating back into the 1990s, and the number of messages on active boards runs to the thousands — 39,302 on the Jones Family Genealogy Forum, for example. As Greg notes, the GenForum boards aren’t going away completely, but after September 30th, we won’t be able to post any more comments or queries there. The boards will be read-only — meaning people will still be able to see what’s there, review what’s been posted, even contact posters who’ve left valid email addresses. But no additional, new, updated or corrected messages can be posted after that date. Meaning we have 85 days left to review those boards, the ones important to us and to our families. Eighty-five days to ask our remaining questions, post links, update our contact data. Eighty-five days to put the word out to people researching the same surname, or geographical area, or ethnic group. Eighty-five days left to get the last word in. Because when the clock ticks over to the first of October, nobody else is going to be able to weigh in on that ranging debate about whether Robert and Anna were the parents of James — or whether Stephen and Sally were. Nobody else is going to be able to dispute that claim about William Jr. being the son of William Sr., rather than just a younger family member living in the same area at the same time. • Queries to people in particular family lines for DNA testing. • Queries about locations of specific records — like Family Bibles — once reported to exist. • Follow-ups on records mentioned in older messages. • And, of course, our latest (and last!) conclusions on specific issues of family history (that William Sr. and Jr. debate, for example), citing sources. But the most important of all is the one Greg highlighted: “be sure to use an email address with your account that you plan to keep the rest of your life. If they have an old address on record, you might consider changing your settings to reflect your latest.” You might even want to create a new one, just for this purpose, add it to your account record there, or post it in a form that won’t be so easily harvested by spammers (such as “yourname (at) service dot com” rather than “[email protected]”). Because, as Greg notes, even though the GenForum boards aren’t nearly as active today as they once were, posts to those boards still show up very high in the search results on Google and other search engines, making them an excellent way of reaching people looking at the same families — and giving them a way to reach you — well into the future. “Just a thought,” he said. Thanks for that thought, Greg Boyd. I so appreciate knowing about this. Back in the “olden days,” forums such as Genforum thrived and provided such a great opportunity for individuals to to share and interact. I found wonderful connections to distant relatives and both shared and received so much via the forums. Sadly, I’ve watched many of the forums and lists essentially dry up over the years as more records have come online, and truthfully, it makes me sad. While absolutely the blossoming of online record sources has been a great boon and blessing to genealogists at all levels, I received a great deal from individuals that can’t be found in any record repository. Things such as copies of Bible records and records held by private individuals, pictures etc. were widely shared. I know that online trees have somewhat replaced that avenue, but it just is not the same. Without a doubt, I find more actual records online today than I ever did “back then,” but I miss those days and wish we would have somehow blended the two worlds a little better. I will absolutely get my final word in on Genforum and appreciate the heads up. I couldn’t agree more that losing the activity in these boards is a real loss, Michelle, and hope folks will take this one last opportunity to speak up! Thanks for this Judy and Greg. It sounds a bit like the last minutes of a Silent Auction. Everyone can be poised over their keyboards for the very very very last post. Now that mental image is a hoot, isn’t it? It was such a disappointment to hear that Ancestry was shutting down GenForum, whose format and interface I greatly prefer to that of the Ancestry/Rootsweb message boards. Over the years I have found tons of useful information on GenForum. Now every time Ancestry purchases another service, there is good reason to worry that it will ultimately be the death knell for that service. Wow, I wish I had this advice before some other forums and bulletin boards closed down. I still get replies and advice on posts I made well over a dozen years ago. I’d better act fast!